Well, the Kauni finally arrived yesterday afternoon. What a relief! No indication of where it had been all this time. Jackson is being good and I can now leave him out of his cage if I go outside to pack parcels. If I am not around he goes in his hammock and sleeps. He is so affectionate – always speaks when I re-appear and purrs. He talks all the time – when he is playing by himself, he talks to the toys and growls at them if he cannot reach or catch them. We are not going out to eat tonight but may go out for a drink later. One of John’s crowns came out last night whilst he was eating Peanut Brittle. He has glued in back with Super Glue! I am having a cooking afternoon and am making Brownies followed by Meringues. Then I am making Beef Goulash for dinner and a Chicken Curry for lunch tomorrow. Back later. I am trying to write this whilst Jackson is asleep – once he wakes up, there is no peace! He loves chasing my mouse as I click it to move around the screen. Still no Kauni box – but I think we are getting there. Apparently they were searching for my house by post code and it is called Partridges in the national database but the box is addressed to #1 and so they could not find the address. Everything else from Kauni has always been delivered to #1 with no problem so I don’t know why it is different this time. Kauni have forwarded the house name and so, hopefully, it will arrive soon. I am going to clip Jackson’s claws in a moment – I think he will let me. Otherwise he will have to go to the Vet!! I am getting some Noro at a special price next week……stand by!! Back tomorrow. Not a good day so far. It now seems that my replacement box of Kauni is also missing. It seems to have been placed on a flight from the Netherlands and then nothing. The new Furin from Noro along with the remaining shades of Taiyo came today – also some new SIlk Garden Lite and Silk Garden Sock and the World of Nature #29. I will put them in my store tomorrow. Jackson is being good and I can leave him out of his cage when I go outside to pack parcels – he goes in his hammock and waits for me to come back. I have purchased some nail clippers to trim his claws with. John is not going to London to have lunch with Kevin tomorrow. He had the hands free phone fitted in his Land Rover yesterday and it works well. My car is already wired for a phone but I need to have something done so that I can use it with my iPhone. I don’t really think I can justify the cost as I never use it whilst in the car! Speaking of cars…….I have my eye on a Mercedes SL 500 – the big brother to my SLK. It is black with red leather. If only I could win the lottery – this is not very likely as I do not do it. Now I must away to the kitchen – I am cooking Oriental Belly of Pork with Rice, Peas and Prawn Crackers! Back tomorrow. It snowed heavily first thing this morning and I was supposed to be going to the hairdresser but could not get my car out of the drive. John took me in the Land Rover and collected me when I was done. Jackson has really hurt my legs with his sharp claws – I shall have to get some clippers. 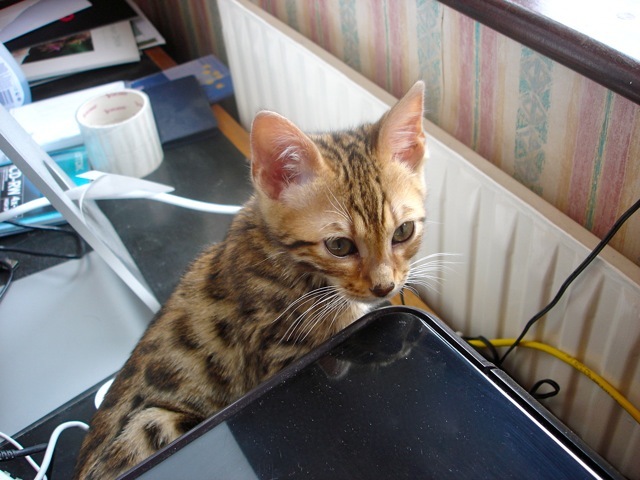 I think he may be teething soon as he seems to want to bite on hard things – apparently Bengals are bad tempered when teething! No deliveries – I am now expecting Kauni, Rowan, Rowan Buttons and Beads and Noro. I give up!! Tomorrow I have to collect John from an Audio shop as he has to leave the Land Rover there to have his mobile phone fitted so that it is hands free. Then on Thursday he is going to London to have lunch with Kevin and so I shall have to take him to the station and collect him on his return. I just hope the snow has gone! Jackson is very quiet and not in the room – I had better go and track him down. Jackson has discovered the radiator behind my desk and sits there whilst I am at my Mac. He has been naughty – details are in his blog. We went out for a meal last night – I had steak which was nice and John had fish. Then we went to the drunken landlord’s pub for a drink – he was very much worse for wear and seemed to be in a daze. The pub was nearly empty – I don’t think he will be able to stay as landlord unless he pulls himself together. I had a mishap just now. I thought I would roast some celeriac with walnuts and cheese to go with our roast pork for lunch. I decided to par boil the celeriac before roasting it. I completely forgot about it and it boiled dry and the kitchen was full of steam! I managed to rescue the pieces that had not touched the base of the pan and I think there will be enough. I also have managed to clean the pan, so all is not lost. Now I must go and see to the roast potatoes and make a pudding – back tomorrow. Jackson is keeping me on my toes. He has sussed out that it is warm in front of the fire and beside the radiators – I had a hot water bottle on my back today as it is aching and he soon found it and curled up on it when I got up from my chair. I am getting a vast – and I do mean vast – amount of buttons, buckles and beads from Rowan soon. No sign of the Kauni delivery yet…..I hope this second box has not got lost! Nothing special happening this weekend – we may go out for a meal and I am cooking pork on Sunday. It is cold and damp here – wish Spring would hurry up! Back tomorrow. We went to the 3 Horseshoes last night and, as it was Pancake day, Paul was cooking pancakes over the open log fire. The fire was far too hot and the pancakes were all burned – and then he spilt some of the batter on the actually fire and the smoke was awful!! I received an email from Kauni to say they have dispatched a duplicate order to me – let’s hope it gets here. No Rowan delivery – things are so slow. Jackson has been good apart from finding the toilet roll and unwinding the lot and puncturing it with his claws. I can’t believe it is a week tomorrow that we collected him – I am going to weigh him tonight and see how much weight he gains each week.